It’s full on summer time friends! And Pittsburgh’s fantastic independent radio station, WYEP 91.3 FM is hosting their 12th annual, amazing Summer Music Festival to help celebrate summer with 4 great bands. Kind of made a natural fit then for hand screenprinted posters right? When Brian of WYEP asked me if I would be interested, I was definitely excited to design and print a poster for them. What: The WYEP Summer Music Festival with Sam Roberts Band. Also appearing are Dar Williams, The Duhks, and Meeting of Important People. Where: Schenely Plaza, in the Oakland section of Pittsburgh. 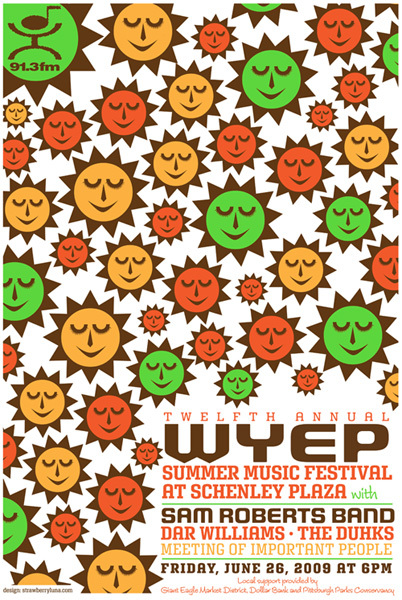 Grab a blanket and enjoy live music on the lawn at Schenley Plaza as WYEP kicks off the summer. Cost: FREE! And open to the public. The poster above will be available for purchase as a hand screenprinted, 4-color poster in an limited edition of only 100 posters. Proceeds to benefit WYEP. I will be there selling posters and chatting with fellow-summer-loving Pittsburghers and enjoying the line up of great bands on a pretty Friday night. Come say hi! Below are a few process shots of me printing this poster at AIR print studios here in Pittsburgh, with more on my Flickr page too. 4th & final color printed, all done!